Study Set transforms your regular assessment into engaging review tools. With up to seventeen apps to choose from and one material from you, you may now present your questions in various ways. To start creating your first Study Set, click the 'Manage Study Set' icon on the top left of your deck. Configure your Study Set by providing a name for it. Insert term/ question, definition/ answer or image to complete your configuration. You may insert your image or from Google Search. Repeat the same setup in the next category. Once you have completed your configuration, you may now select the type of Study Set App to be used as a challenge for the student to explore and master. Find out how each of these Study Set Apps translates your questions by reading them individually here. 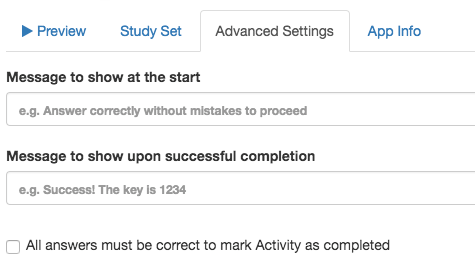 In each Study Set, click on the 'Advanced Settings' tab to display a message to be shown at the start and end of the challenge. You may also activate 'All answers must be correct to mark Activity as completed' for each Study Set.' By activating this, it means the student will need to get a perfect score to proceed to the next challenge. The configuration in the 'Advanced Settings' for Study Set is optional.